When Sam Houston State University students return from the Thanksgiving holiday, the 2007 fall semester will be almost over. The last class day will be Dec. 6, with Dec. 7 designated as a study day. Finals are scheduled for Dec. 8-13. Dorms close at noon on Dec. 14. Commencement for the College of Humanities and Social Sciences will be held at 6 p.m. on Dec. 14, with Dec. 15 ceremonies for the Colleges of Arts and Sciences and Business Administration at 10 a.m. and Criminal Justice and Education at 2 p.m. All ceremonies will be in Johnson Coliseum. Christmas holidays for the staff will be Dec. 24-31 and Jan. 1. Dorms re-open Jan. 13, and the 2008 spring semester classes begin Jan. 16. Scott Kaukonen, assistant professor of English, will introduce his novel-in-progress, “The Martyrdom of Katie Deeds,” during a literary reading on Thursday (Nov. 29). The reading will be held at 6:30 p.m. at Austin Hall. “The Martyrdom of Katie Deeds,” his current work, explores the intersection of fundamentalist and evangelical Christian culture with American consumer culture over the body and legacy of a dead 16-year-old preacher’s daughter, according to Kaukonen. He may also read from his prize-winning collection of short stories, “Ordination,” a collection of stories of “men and boys who like to see themselves as worthy of the titles of father, son, husband, lover, and friend, but who must fight their own instincts and desires to claim such honors,” he said. Published by Ohio State University Press, “Ordination” is the winner of the Ohio State Prize for Short Fiction. Kaukonen’s stories and reviews have appeared in Third Coast, the Chicago Tribune, the Cincinnati Review and the Missouri Review. In addition to finishing “The Martyrdom of Katie Deeds,” he is also currently working with English professor Helena Halmari on a translation from the Finnish of “Pet Shop Girls,” a novel by Anja Snellman. For more information, contact the English department at 936.294.1403 or Kaukonen at 936.294.1407. Ilonka Rus’ collaborative piano class will “dance” through a number of romantic, classical and impressionistic pieces during the “Dueling Piano Extravaganza” on Saturday (Dec. 1). The concert will be held at 6:30 p.m. in the Recital Hall. “It is called dueling because there are always two students playing together at the same time, (either) on one piano with four hands or on two pianos with one student per piano,” Rus said. Among the pieces that will be “dueled” during the performance are Carl Reinecke’s “Nutcracker and Mouseking Op.46;” Johannes Brahms’ “Hungarian Dance” Nos. 11, 13 and 21; John Corigliano’s “Tarantella,” (a traditional form of southern Italian dance); and Charles Gounod’s “Waltz” from “Faust.”	The collaborative piano class is comprised of piano, music therapy or music education majors. The concert is free admission. 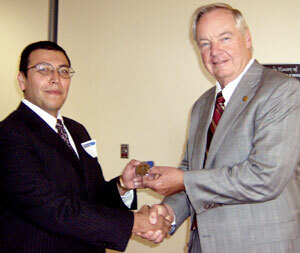 COBA dean R. Dean Lewis (right) presents an honor medallion to business major Hector Cordova to accompany Cordova's Beta Gamma Sigma invitation. Beta Gamma Sigma recently tapped 10 of the College of Business Administration’s “top business students” into its James E. Gilmore Chapter for the fall semester. Wan-Chen Chen, Hector Cordova, Kimberly Defee, Brian Goodwin, Jody Hestand, Pamela Johnson, Keith Lofton, Joel Martinez, Paul Provost and Jerome Spear were all honored at a reception on Nov. 1, during which COBA dean R. Dean Lewis presented them with Beta Gamma Sigma honor medallions to be worn at graduation. The induction ceremony will be held in the spring. The international honor society for business students has a worldwide network of more than 560,000 professionals who have earned recognition through lifetime membership in Beta Gamma Sigma. To be eligible for membership in the organization, students must rank in the top 10 percent of the baccalaureate and top 20 percent of graduate programs at schools accredited by AACSB International—the Association to Advance Collegiate Schools of Business.